Easily upgrade your existing ISO 9001:2008 quality management system to meet the requirements of ISO 9001:2015. The ISO 9001:2015 Upgrade Kit contains new procedures, new forms and instructions on how to modify your existing quality management system and its documentation. Like all our products, the ISO 9001:2015 Upgrade Kit is specifically designed for ease of use. There are no complicated instructions or technical vocabulary that so often make ISO 9001 unnecessarily complicated. 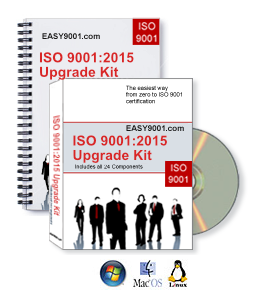 Most importantly, the ISO 9001:2015 Upgrade Kit doesn't require that you re-write your existing ISO 9001 documentation. You already put significant efforts into customizing your ISO 9001 quality manual and procedures, and most of your documentation may be kept as is. So we prepared detailed, step-by-step instructions on how to revise your existing ISO 9001 documentation to make it ISO 9001:2015 compliant. Only for those brand-new ISO 9001:2015 requirements without equivalents in ISO 9001:2008, we provide you with all-new procedures templates (with customization instructions) that you can simply add to your existing ISO 9001 documentation as appendix. In order to make it easy for you to meet those new requirements, we designed all-new forms which we included together with customization instructions. The “Customization Instructions for ISO 9001:2015 Procedures” explain for each of the seven new procedures how to modify them to make them fit your company's individual circumstances. The “Customization Instructions for ISO 9001:2015 Forms” explain for each of the nine new forms and checklists how to modify them to make them fit your company's individual circumstances. For most companies, no substantial modification will be necessary. You are not alone during the upgrade to ISO 9001:2015! Our team of senior ISO 9001 experts is standing by to assist you with personal customer service. Please contact us anytime 7 days a week, and you can expect a competent and detailed response that addresses all your questions.